We’ve been busy this autumn, as the weather changes and people start spending more time indoors, and that means people are focusing more on their interiors. Whether you need help with storage, creating space or dividing your space, Space Solutions can help. Here’s just a few recent projects we’ve completed this month. Many homes have valuable space surrounding a fireplace, and custom cabinetry both completes the space and provides essential storage. 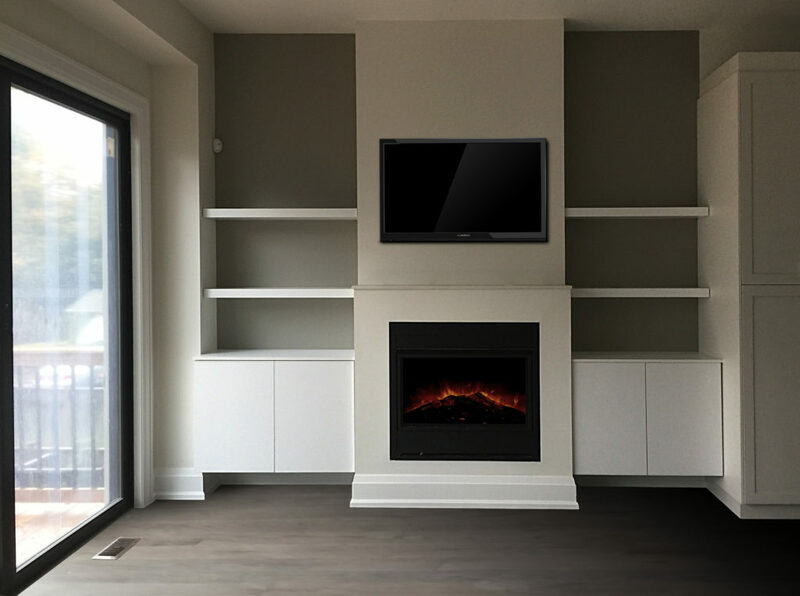 In some cases, we may even build cabinetry to accommodate a new electric fireplace that you provide. Here’s an installation that provides simple, elegant storage in the alcoves on either side of a hearth. We used supermat white for the structures, and added “floating shelves” above the cabinets. The open shelves are anchored on the sides for a guaranteed installation that still offers the floating look. Supermat is an ultra-smooth finish that looks as great as it feels, and comes in a variety of colour options. Using touch latch hardware on cabinet doors allows you to skip handles, and keep clean lines. A major goal with any custom wall unit is making living spaces more livable. This built-in uses classic white with shaker-style doors, a timeless look. 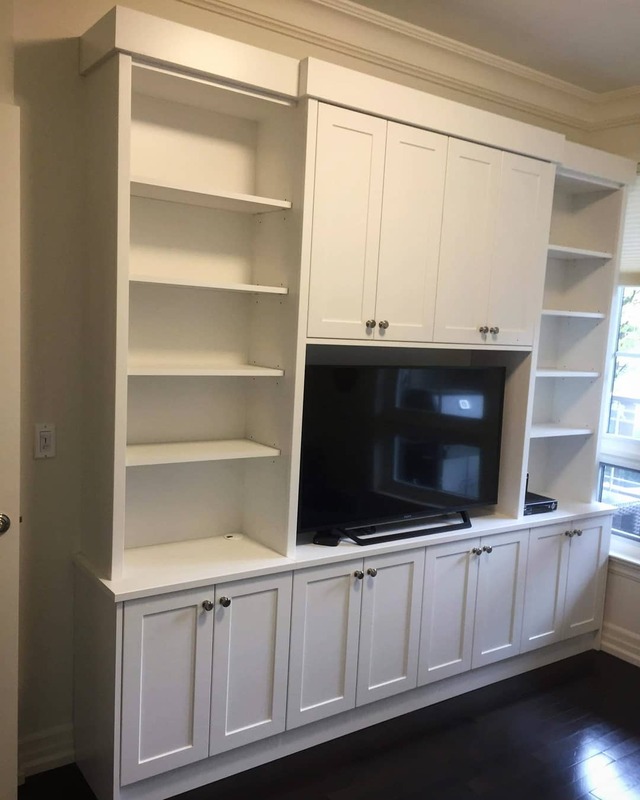 With inset upper doors and a simple applied top trim, this custom cabinet focuses on function and provides ample storage for any space. Drilling holes for adjustable shelves in groups keeps the structure from looking too busy, while still affording flexibility. Custom walk-in closets are essential storage for any home. 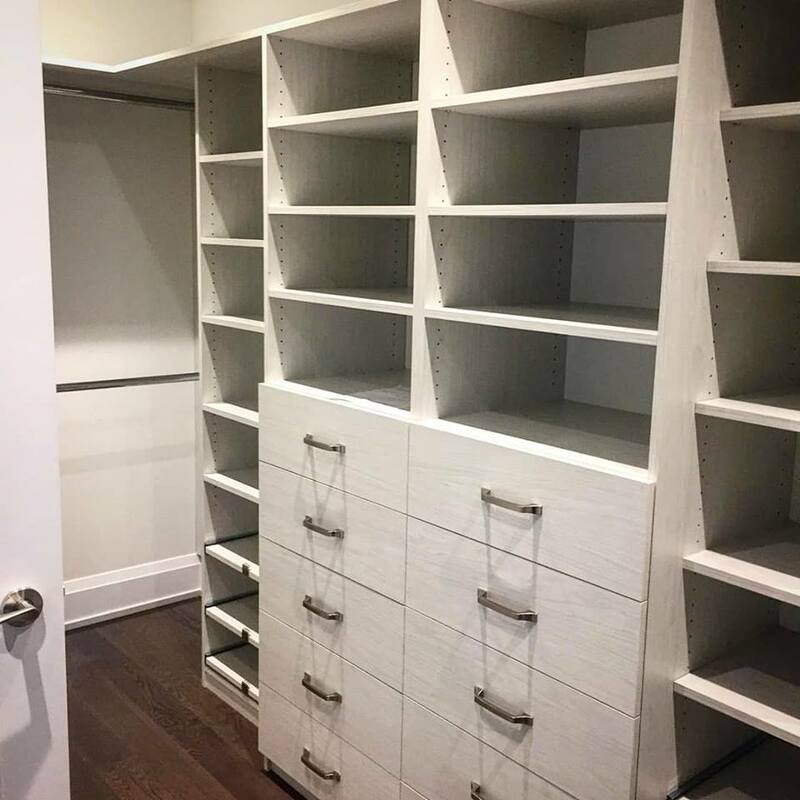 We design your custom closet not just for your space, but for your needs and your style, and every closet solution can be an unique as you. This walk-in closet offers a contemporary look, with simple drawer fronts. We used Weekend Getaway, part of Tafisa’s Viva Series of finishes, which provide great tones and textures. Solid nickel handles make a statement that is functional and attractive. Recessed shelves ease access to the clothes hanging along the back wall, and pullout shelves are ideal for shoe storage. Our custom door program continues to be ideal for not just closets, but also for room dividers. 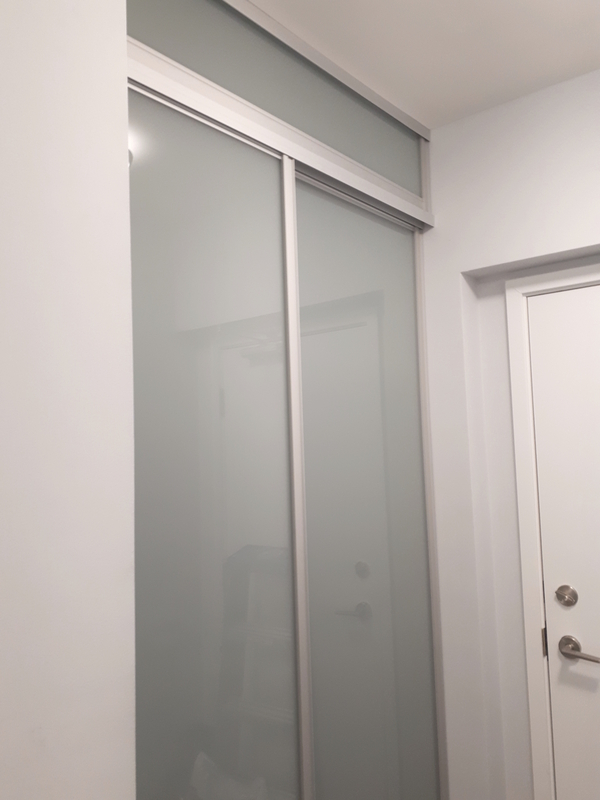 Smooth-running European aluminum hardware provides guaranteed operation, and using frosted white lami glass provides privacy without darkening the space. In some cases, such as this one, we get asked to do something extra creative. Rather than take the door panels all the way to the 9-foot ceiling, we installed a fixed glass panel at the top and sliding doors below, creating a transom effect. Smooth aluminum hardware frames the fixed overhead panel. There’s still time get have your custom solution installed before the holidays! To get started, call us during business hours at 416.322.5575, or after hours, use this handy form to request an in-home consultation!